What Is A Xie Jiao? You are here: Home / Featured / If Your Religion is a Xie Jiao, You Go to Jail – But What Is A Xie Jiao? Since the late Ming era, China has used xie jiao to designate religious movements the government does not like. Their repression has always been brutal, but what a xie jiao is, is far from being clear. 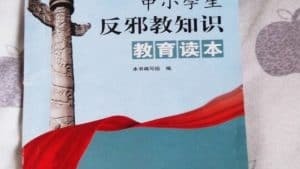 Bitter Winter published on July 27, 2018, a secret document of the Chinese Communist Party (CCP), detailing a vast campaign aimed at “eradicating” groups classified as xie jiao. But what are xie jiao, exactly? The Chinese expression xie jiao is translated in Chinese official documents into English as “cults” or “evil cults.” The translation, however, is wrong, and is connected to an attempt to argue that the problem of “cults” is not only Chinese, but international. In fact, the notion of xie jiao was born in the Ming period, and a more correct translation is “heterodox teachings.” The Ming preoccupation with xie jiao was rooted in a century-old tradition of Chinese millenarian movements trying to overcome the governments. While some of them posed very real threats to the Empire, others were outlawed based on a variety of political and religious consideration. What teachings were “heterodox” was determined by the Emperor, and lists of xie jiao were based on both theological and political grounds. For example, Christianity as a whole was classified as a xie jiao in 1725, but taken out of the list in 1842, due to Western political and military pressure. The Republican and Communist governments inherited this old notion and policy. The category of xie jiao was used both in Taiwan, during the Martial Law period, and in Mainland China in the 1950s for the now forgotten massive persecution of Yiguandao, a large Chinese non-Christian new religious movement, which in fact became the model for the subsequent repression of other groups. In the campaign against xie jiao of 1953–1954, largely directed against Yiguandao, according to police reports, 820,000 “leaders and organizers,” and 13 million followers were arrested or otherwise persecuted. Xie jiao, however, was not the main term used during these campaigns. As David Palmer has noted, the CCP preferred to define the persecuted groups as “reactionary secret societies” (fandong huidaomen) or “feudal secret societies” (fengjian huidaomen), labels which reflected Mao Zedong’s (1893–1976) idea that actually some secret societies had played in Chinese history a progressive rather than reactionary role. Huidaomen was later used to emphasize that banned groups, although they might use the mask of religion, were not “really” religious, were similar to organized crime, and remained outside the area of religious liberty theoretically guaranteed by the Chinese Constitution. However, xie jiao came back as the most used term in the 1990s. Hong Kong scholars David Palmer and Edward Irons believe that a return to the prevalence of the label xie jiao, which was again preferred to huidaomen, was determined by the CCP’s attempt to elicit the sympathy of both those opposed to “cults” in the West and the mainline Christian churches, which feared the competition of Christian new religious movements they regarded as heretical. However, a systematic theory of the xie jiao as “evil cults,” a translation, as mentioned earlier, adopted by the Chinese regime itself but in fact less accurate than “heterodox teachings,” emerged only with the incidents of the late 1990s that persuaded the CCP that Falun Gong was a dangerous competitor and enemy. This generated the inclusion of a new crime, “using” a xie jiao, in the Chinese Criminal Code in 1999, the creation of a special police unit called Office 610 (from the date of their establishment, June 10, 1999) for dealing with the xie jiao, and the establishment throughout China and in some centers of the Chinese diaspora abroad of branches of a Chinese Anti-Xie-Jiao Association (again, called in English “Chinese Anti-Cult Association”), directly connected with the CCP. When these measures came into effect, the old practice of compiling official lists of xie jiao had already been revived, with the first national list published in 1995. Article 300 of the Chinese Criminal Code made “using” a xie jiao a crime punishable with jail penalties from three to seven years “or more.” It is important to determine what “using a xie jiao” exactly means within the context of Article 300. Not all decisions of the Chinese courts are published online, but thousands of them are. 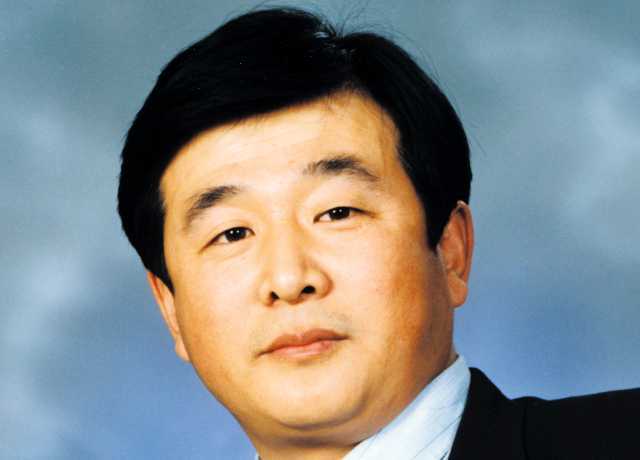 There is a vast number of published decisions where members of xie jiao, were sentenced to long jail penalties (often exceeding seven years) based on Article 300. It is clear from these decisions that “using a xie jiao” is interpreted as “being active in a xie jiao” in any capacity. Although leaders receive harsher punishments, it is by no means necessary to be a leader to be recognized as guilty of having “used a xie jiao” under Article 300. In fact, having been found in possession of literature of The Church of Almighty God, one of the most targeted xie jiao, or having tried to convert others to the Almighty God faith, have been regarded as sufficient evidence of being guilty of the crime punished by Article 300. Monetary rewards are offered in China to those who supply the police with names of members of xie jiao, and information leading to their arrest. Again, higher rewards are offered for the “leaders,” but rewards are paid also to those who denounce a simple devotee. Some of these rewards tables are, or were, posted on the Internet by the relevant Chinese authorities and local media. In practice, such broad definitions mean that groups that are regarded as xie jiao are those that are included in the lists of xie jiao periodically updated by the Chinese authorities. There are different approaches to the xie jiao question within the CCP itself. Pastors of the government-controlled united Protestant church known as the Three-Self Church, who are often members of the CCP, are supported by a venerable tradition when they insist that xie jiao should be defined as heretical groups that deny the basic truths of traditional religions. The party’s Marxism notwithstanding, they believe they can persuade the CCP that the only antidote to bad religion is “good” religion. This notion presupposes that it is possible to define “bad religion.” Since Christian groups such as The Church of Almighty God are now prominent in the Chinese xie jiao discourse, the proposed standard is the Protestant interpretation of the Bible. 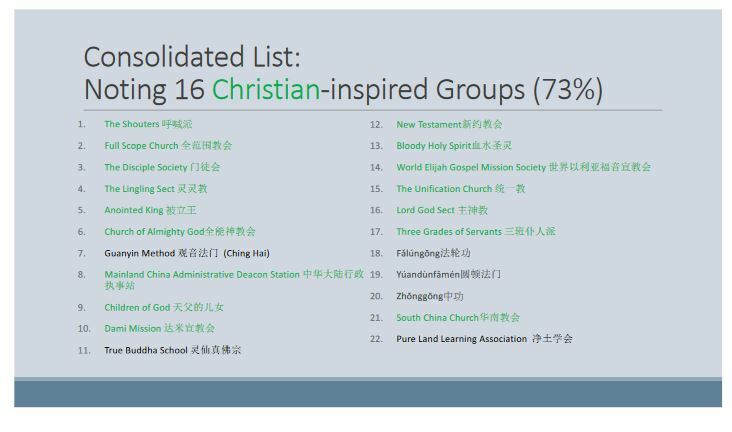 “Unbiblical” groups are xie jiao. Pastors are less competent when it comes to criticizing non-Christian groups such as Falun Gong, but they may claim, analogically, that they represent heretical distortions of the Three Teachings (Buddhism, Confucianism, and Taoism). It is somewhat paradoxical that an officially irreligious state may seriously consider deciding which religious groups should be repressed based on criteria such as the nature of Jesus Christ or the traditional doctrine of the Trinity. Yet, there are those in the CCP who believe that, while religion would eventually disappear in a distant future, for the time being, the best way of eradicating xie jiao is to promote pro-governmental Christianity in the shape of the Three-Self churches and rely on the propaganda of their pastors. Some Chinese academics imported from Western anti-cultism the notion of brainwashing as the distinctive character of “destructive cults.” This was another paradox, since the very word “brainwashing” was originally coined by the American intelligence during the Cold War to support anti-Chinese propaganda. Brainwashing was something the evil Chinese Communists did. Chinese courts, including the People’s Supreme Court, stayed away from brainwashing controversies and, as mentioned earlier, described xie jiao as groups spreading “superstition,” which is defined as something opposed to both science and socialism, and different from genuine religion. In fact, xie jiao are also defined as “pseudo-religious” movements. As American scholar Gordon Melton noticed, it is important to emphasize that for the CCP and the Chinese courts xie jiao are not religions. Any Western objection about religious liberty is dismissed as irrelevant. Chinese authorities would answer that religious liberty is guaranteed by the Chinese Constitution, but xie jiao have nothing to do with religion. This is an old attitude, and not only a Chinese one. Usually, those hostile to “cults,” when confronted with the objection that the repression of “cults” violate religious liberty, answer that “cults” are not religions. This was the position of the anti-cult camp in the “cult wars” of the late 20th century. But the position dates back to at least one century before the “cult wars.” It was difficult to deny that in 19th-century America Catholics were discriminated and persecuted. On the other hand, America’s patriotic narrative portrayed the United States as a country whose very origins very rooted in the affirmation of religious liberty. Anti-Catholic crusaders such as Charles P. Chiniquy (1809–1899), a former Canadian Catholic priest turned Presbyterian minister, insisted that Catholicism was not a religion but a subversive political organization, a business empire, or a criminal racket promoting immorality. It was only by asserting that Catholicism was not “really” a religion that the image of the United States as the country of religious freedom could be reconciled with the American reality of anti-Catholic discrimination. However, in 19th-century America this was merely a rhetoric device, as it is in contemporary China for xie jiao. Who decides that one religion is “genuine” and another only “pretends” to be a religion? Often, as sociologist Larry Greil claimed in 1996, “religion” is “not (…) a characteristic which inheres in certain phenomena, but (…) a cultural resource over which competing interest groups may vie.” And the competition, in different ways in democratic and in totalitarian societies, is settled not by science but by power. In 21st century China, the motto of the imperial Roman jurist of the 2nd-3rd century AD, Ulpianus (170–223), still resonates: “Quod principi placuit, legis habet vigorem,” “What pleases the emperor becomes enforceable law.” The CCP, the new emperor, decides what groups are xie jiao. They are taken out of the sphere of religious liberty and human rights. Their members are in fact de-humanized. They should be, in fact, in CCP’s own slogan, “totally eradicated like tumors.” Tumors have no rights, and can only be eradicated through violence.